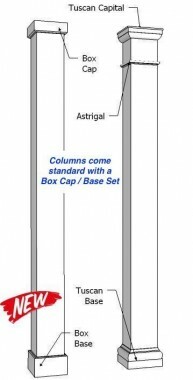 Pultruded columns are made by an Pultrusion process and have a look of cast fibreglass columns at a lower cost! The process involves pulling continuous lengths of reinforced polymer, rather than pushing, as in extrusion through a forming die using a continuous pulling device. Resin, fillers and specialized additives are then added to produce a fine finish. 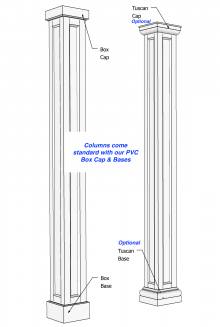 Pultruded Columns can only be made non-tapered. 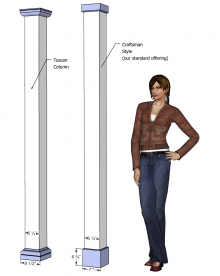 Though these columns look the same as HB&G Fiberglass Columns, they carry only about half of the load bearing capacity or about 5,000 Lbs, which will due for most applications.They are lighter in weight then the equivalent cast columns which makes them easier to ship, carry and install. 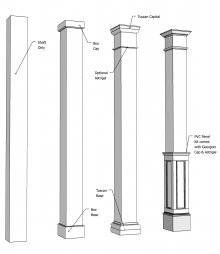 Another difference between the columns is that the Pultruded columns cannot be split. 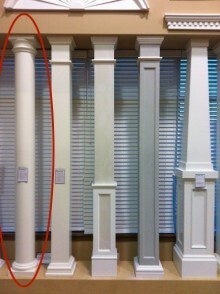 These Pultruded columns are resistant to chemicals, rot, fading, insects, warping and moisture. 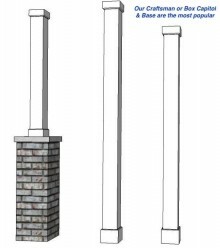 Pultruded Fiberglass columns, come with a with a limited lifetime warranty for material and workmanship when properly installed.